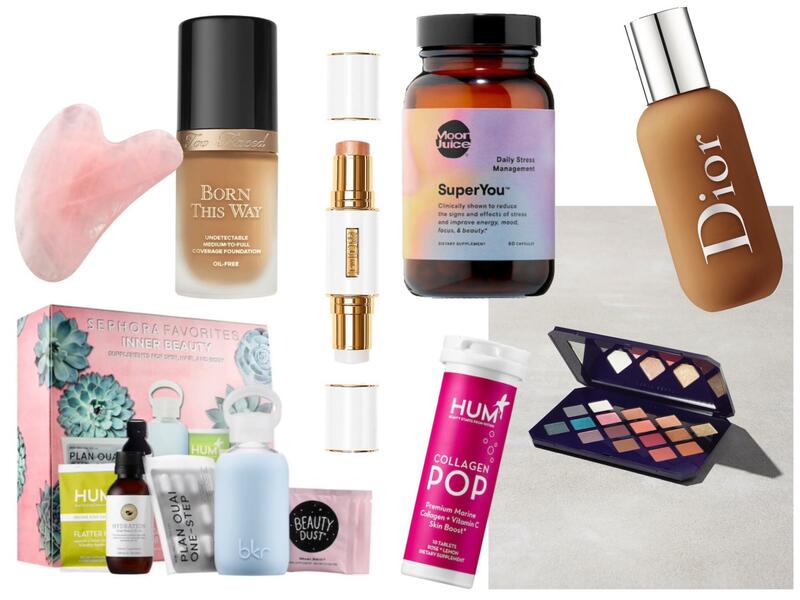 New in Beauty is a monthly series that showcases the latest beauty and wellness products that have launched. Find out what’s at the top of my list. As I’m getting older and my anti-aging routine is getting more serious, I’ve really been in to beauty tools (more on this in an upcoming post). This funny looking tool helps to lift and firm skin by scraping the face in an upward motion. It’s at the top of my to test list. Jackie Aina, my fave youtuber, collaborated with Too Faced Cosmetics to expand their Born This Way Foundation and I can’t wait to get my hands on this! It claims to be medium-to-full coverage with a natural-looking, radiant finish, which is exactly what I look for in a foundation. Pat McGrath Labs has come through yet again with another beautiful, glamorous product. The Skin Fetish Highlighter & Balm Duo seems like the perfect product to create a luminous, model skin look. Super You uses natural adaptogens to fight off fatigue, boost energy, preserve collagen and control weight gain brought on by ongoing stress. Anything that blocks stress is something that I’m ready to get behind. Dior is upping their foundation game with 40 shades of the Backstage Face & Body Foundation. With claims of build-able coverage that’s waterproof and sweat-resistant, this matte foundation may just become a staple in my routine. Collagen is the beauty ingredient of 2018 and HUM Nutrition is making getting your daily dose easier than ever. Just add these tablets to water to transform it into a hydrating, firming, elasticity-boosting drink. We can’t forget about this beautiful palette from Rih-Rih. The Morrocan Spice Palette by Fenty Beauty drops today and the anticipation has been unreal. The shade selection was made for brown girls trying to get that bronzed goddess looked this summer. Those are the new launches on my list. What’s on yours? Help TLM Grow: Enjoying the content? Follow us on instagram, pin this post, and share with a friend to help us reach more people.